The smart phone, Honor Note 10 has the debut and it is added with phablet sized footprint with 7 inch display. This handset has the high end specifications and rivals flagships with the high price tag. Honor Note 10 is the big phablet and has the similar internals to various flagships, which have been launched now. The design of the handset has the resemblance of Honor phones released recently. This handset has the shiny and boxy outer body with trimmed bezels and the frame of the handset is made out of metal with outer body is all glass. The fingerprint sensor is rear mounted. The display of the handset is big 6.95 inch AMOLED panel at FHD+ and has 1080 x 2220 resolutions. The display technology is similar to Samsung phone and it supports HDR10 with 115% NTSC color garmut coverage. You can get the Huawei made Kirin 970 chipset and it was launched with the previous flagships of Huawei. It is the best smart phone chipset and RAM is added with 6 or 8 GB sizes. You can get 64 or 128 GB storage with 6 GB RAM and 8 GB version has the 128 GB storage. It has hybrid dual SIM slot, if you get 64 GB version. Honor Note 10 has the dual cam set up on the rear side, which is powered by same AI goodness for easy professional looking shots. There is primary sensor on its rear side with sports 16 MP resolution at the aperture size of f/1.8. The other sensor has the B/W photos for low light and manages up to 24 MP photos. It has the aperture of f/1.8 with gyro-EIS for stability and it can shoot up to 4K videos. The front camera of the handset has AI beautification ad blur features. It takes 13 MP selfies at f/2.0 aperture and camera can shoot up to 1080p videos. 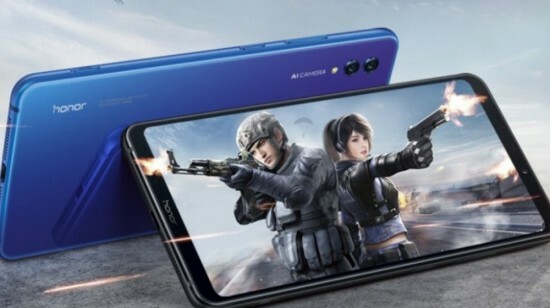 The software is Android 8.1 Oreo runs the proprietary EMUI 8.2 of Huawei on top and Honor Note 10 supports the recently launched GPU Turbo technology of the company and it smoothes out the gaming and it improves the overall frame rate and has wonderful battery life. It is added with dedicated hardware button to push to trigger the GPU Turbo technology. The smart phone, Honor Note 10 is added with big 5000 mAh battery and it supports the Super Charge technology of Huawei and it would not be problem to charge it. The color options of the handset are midnight black and phantom blue. The price option of the handset is started with cheapest 6/64 GB model and it costs for CNY 2799 (Rs.50,000), 6/128 GB at CNY 3199 (Rs.57,500) and 8/128 GB variant for CNY 3599 (Rs.64,500).